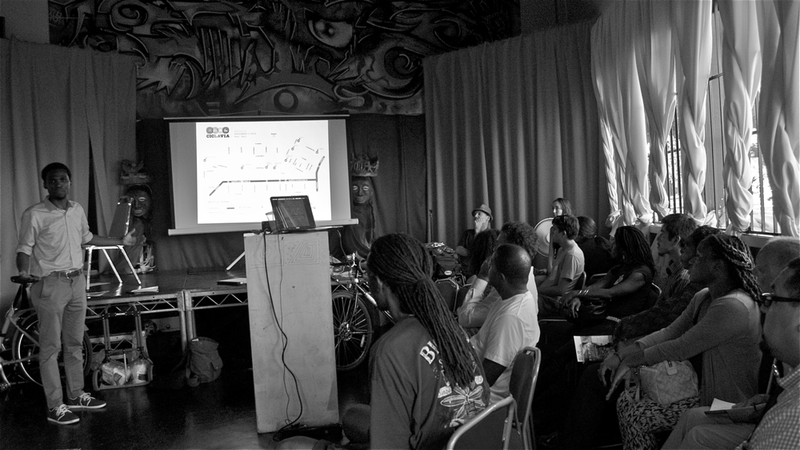 South L.A. residents and advocates gathered at the KAOS Network in Leimert Park last night to learn more about CicLAvia and how the 6-mile route planned through the area on December 7th, 2014, would affect the community. Staff from CicLAvia gave presentations explaining “ciclovias” and describing how the car-free, open streets events had first originated in concerns about the unhealthy conditions of city streets. As people embraced them, they explained, the events evolved into important opportunities for community building. Open streets events here and around the country are now seen as key to creating vibrant public spaces, promoting active transportation and good health, bringing together diverse populations, and giving residents a fun and safe way explore new corners of their city. And, they reassured the audience, the event is inclusive and welcomes pedestrians, skateboarders, and anyone else interested in leaving their car at home for a day. Then, Tafarai Bayne, former CicLAvia board member and current member of the Board of Transportation Commissioners, put up a (still-being-finalized) map of the route that will run between Leimert Park and the Jazz District (below). He told the group that, as it appears at the moment, Leimert Park Village (at the end of the route, at bottom left) will serve as the anchor of one hub and the other, Central Ave., will be closed between Washington and Vernon. King Blvd. will serve as the connective (and, many will be pleased to know, flat) corridor between the two. Organizers had originally considered staging some of the route along Crenshaw so that event participants could more easily access the Expo Line, but the construction of the Crenshaw Line has left much of the street in very poor condition. 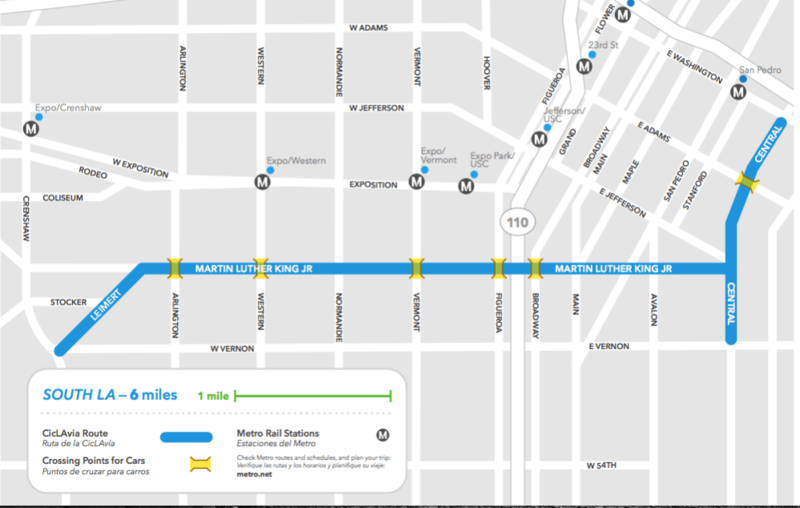 The latest version of the South L.A. route runs largely along King Blvd. between Leimert Park Village and the Jazz District. Yellow points signal crossing points for cars. Central will be closed between Washington and Vernon. Click to enlarge. The route is exciting because it will offer families in park-poor South L.A. the opportunity to turn their streets into a giant park for a day — one that they can play in as they see fit. Given how much the community enjoys the King Day parade along King Blvd., I have no doubt that it will be a smashing success. But it is even more exciting because it is so rare that South L.A. is considered a destination to be celebrated. That step forward represents a personal and emotional victory for advocates like Bayne, one of South L.A.’s more recognizable ambassadors. Having grown up in South L.A., he told the crowd, he was always struck by the lack of “destinations” for folks and how that impacted both residents’ and outsiders’ feelings about the area. A CicLAvia route, he believed, would offer a much-needed opportunity to promote place-making in the area and highlight the positive growth and change it has undergone recently. It would also be a chance to showcase the diversity of the communities that comprise South L.A. and rewrite some of the narratives about the area. Finally, pointing at Community Health Council’s Andres Ramirez Huiztek, he said that it had been a long road to bring CicLAvia to the area. He had bugged CicLAvia organizers about it from the outset and worked with Ramirez and others to rally support for a South L.A. route by organizing a number of exploratory rides in South and Southeast L.A. (see here, here, and here). Other speakers reiterated the importance of community participation in the event to make it a truly South L.A. experience. They detailed the many ways that people could volunteer and how businesses could benefit from a bump in revenue by engaging ride-goers along the route or at hubs (pedestrian zones that showcase community groups, offer bike repair and other information, feature food and merchandise, etc.). They also reassured the group that CicLAvia staff and volunteers would conduct door-to-door outreach along the route beginning months in advance. They wanted neighbors and businesses to have adequate time to prepare for the closure of the street. Most of the questions from the audience had to do with street closure logistics. They wanted to know that residents would be able to access their homes or transit, that businesses would not be adversely affected, and that folks in the church-heavy area could still get to their sites of worship. In all cases, they were reassured that CicLAvia would work with the community to make the event as minimally disruptive as possible and they would help churches and businesses find (and, when appropriate, pick up the tab for) alternative parking arrangements, if necessary. “What if it rains?” someone asked. Aaron Paley, the Executive Director of CicLAvia, acknowledged that holding a December event wasn’t necessarily ideal, both because of the shorter days and the potential for weather issues. They had a policy to try to hold events within 60 days of a cancellation (e.g. in the case of a heavy rain), he said, but he’d also never been rained out in all his years of organizing. Then, he and the other organizers knocked on wood. Today and tomorrow, Erick Huerta and I are accompanying CicLAvia staff and volunteers as they conduct outreach in Boyle Heights for their October event, so we’ll have more specifics regarding that process and community reactions next week. If you’d like to learn more about CicLAvia, please click here. You can volunteer to help out with preparation for the October event, here.